Having spent 5 years as a design engineer in avionics, Dr. Karen Rethmeyer returned to dental school in Kansas City, graduating first in her class. 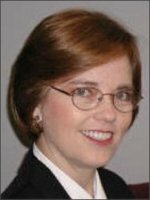 She is a Master in the Academy of General Dentistry (www.agd.org) and has trained extensively with the Pankey Dental Institute (www.pankey.org). The Academy of Dentistry International (www.adint.org) recently inducted Dr. Rethmeyer as a Fellow for her work in Guatemala. She is a member of the American Dental Association, the Missouri Dental Association, and serves on the board of directors for the Greater Kansas City Dental Association. She is a member of several local and national dental study groups and charitable organizations. She enjoys spending time with her family, gardening, cycling and church activities.